Wandering from stage to stage with a beer in hand and enjoying the various melodies of francophone music is the perfect way of describing a typical day at the Montreal FrancoFolies. 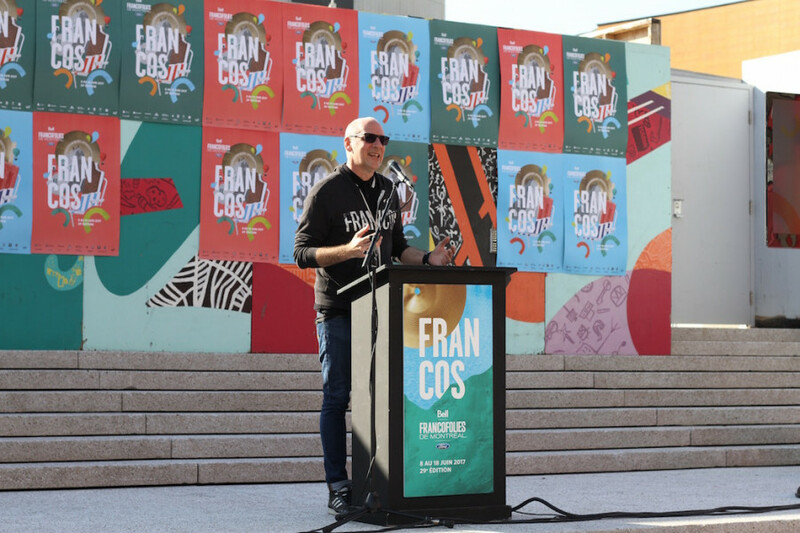 Les FrancoFolies has unveiled its outdoor program for their summer festival this past Tuesday atop the staircase of the Quartier des Spectacles. The lineup features a variety of musical genres including rock, hip hop, electronica, world, pop, reggae, folk and many more. This year boasts 150 free outdoor concerts that’ll be performed by musicians from several countries such as Belgium, Algeria, Quebec, Acadia, France, Switzerland and many more will invade the heart of the Quartier des Spectacles for 11 days of endless music. For Canada’s 150th Anniversary celebrations, the FrancoFolies will put together an event celebrating multiculturalism on June 27 at 2 p.m. at the park by St. Urbain St. and Maisonneuve. The event will present an array of surprise activities, music and a BBQ, with a collaborative program from Vision Diversité, Mundial Montréal and the Festival International Nuits D’Afrique de Montréal. “We have a special partnership with the Federal Government with an event celebrating different cultures,” said Jacques-André Dupont, President and General Director of Les FrancoFolies de Montréal. As well, FrancoFolies will have a huge concert on June 18 that will last from 3 p.m. to midnight for Montreal’s 375th. The program will feature several well-known artists, including Les Cowboys Fringants, IAM, Tiken Jah Fakoly, Philippe Brach, K.O.K.A. and LOUVE. Throughout the festival, the Bal Pop’ Loto-Quebec will take over the Esplanade, replicating the ambience of Paris’s large hill, Montmartre. Caricaturists and resto kiosks will serve up French flavours, while Le Petit Orchestre Parisen entertains and gets the crowd dancing every day from 6 p.m. onwards. The classic return of the Foires des Francos presented by CISM 89.3 FM will gather onlookers and help them to discover local music, art and fashion. The event will host more than 60 exhibitors, including a live performance from Le Couleur on June 10 at 11 a.m. to 4 p.m. in the Zone Coors Light. Laurent Saulnier, Vice President of the festival, is excited for this year’s lineup. “[There will be] so many tastes and colours for music and there are so many amazing shows happening,” she said. Concerts will be held every night at 9 p.m. on the Bell Stage, with the first one starting June 8 at 6 p.m. on the Ford stage. Several artists such as Dumas, Paul Piché, 2Frères, Koriass, Yann Perreau and many more will help kick off the summer in the right direction. Artist Yann Perreau has participated in nearly every edition of Les FrancoFolies de Montréal since 2002. This year, he will present his new project, Perreau et la Lune, his recent album, Le Fantastique des Astres, along with a special tribute concert to French composer Richard Desjardins.